Various of WIP from my last pages of Naruto Doujinshi. 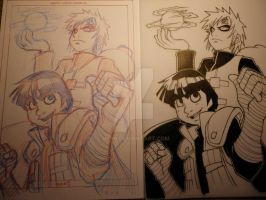 i love the desing of the full page in the first pic, i like the composition, even the simple that can be, i love it! YESH! It's ready dattebayo! I can't wait to see the final thing, even if I had to pay for it… your art is so pro, amazing, original and lovely that it's worth it. n_n I have much to learn from you! I just hope the final thing thing will be ok when printed !